The tool panel is divided into two parts. 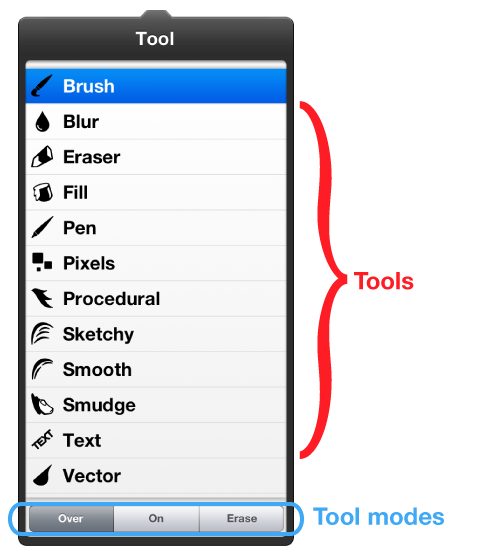 At the top is the set of tools available in SketchClub and at the bottom are the tool modes. Tools provides different functionality and each has different settings that can be configured in the tool settings panel. Tool modes let you change how the current tool modifies your sketch. mode let's you draw new things in the current layer. This is the normal mode you'll be using most of the time. mode restricts what you draw to only areas you've drawn before. You draw "on" top of stuff and transparent areas remain transparent. mode let's any tool operate as an eraser. It removes stuff you've already drawn in the shape and style of the active tool.